The winners of Rugby’s 2016 Sports Awards were announced on Wednesday evening, recognising a fantastic year of dedication and achievement. Organised by Rugby Borough Council and supported by the Rugby Advertiser and Rugby FM, whose breakfast show presenter Jason Moss hosted the evening, this was the 22nd staging of the awards. They attracted well over 100 nominations this year, making the judges task more difficult than ever. Joining those shortlisted was former Coventry City footballer David Busst, who was guest speaker at the Benn Hall celebration. The Simon Warwood Memorial Award for Young Sports Team of the Year, being awarded for the 25th time, was presented to Rugby School’s 1st XV rugby team by Simon’s parents Robin and Margaret Warwood. The squad had achieved the school’s first unbeaten season since 1978 with player Tom Hardwick also earning an England U18s cap. Runners-up were Hillmorton Football Club Under 11s and Rugby Thornfield Indoor Bowls Club. The Lion Geoff Thompson Young Volunteer of the Year award, which includes £100 for the projects, went to Leah Evans, who coaches netball at her old school, Boughton Leigh Juniors and also organised a rounders club in the holidays. Runners-up were Estella Haynes (Rugby Lawn Tennis Club) and Imogen Phillips (Rugby Gymnastics Club). The award is sponsored by Rugby Rokeby Lions and was presented by President George King. # Presenting the ten Excellence in Sport awards was Peter Bundey of GLL Sports Foundation, who sponsor the category including £100 for each winner to spend on training or equipment. Those selected this year, who have all achieved at national and international level, were: Lee Kemp (cycle speedway), Jack Lewis (sailing), Clayton Bell (gymnastics), Luke Marsh (gymnastics), Ella Bromley (hockey), Jika Nyirenda (hockey), Rhodes Mitchell-King (ice hockey), Anjali Neelakantan (tae kwon do), Oliver Fowler (bowls) and Corey-Ellis Judge (kickboxing). # The Young Sportsperson of the Year, sponsored by the three Rotary Clubs of Rugby, was tae kwon do student Anjali Neelakantan, who was a World, European and British champion in 2016. Runners-up were kickboxer Corey Ellis-Judge and sailor Jack Lewis. Trophies were presented by representatives of the three clubs, Cllr Kathryn Lawrence and Mike Beck of Rugby Dunsmore Rotary Club. # The Unsung Hero Volunteer award, sponsored by Warwickshire CAVA was presented by Carol Kavanagh and Pam Luck to Linda Peake of Rugby Swimming Club, who has worked tirelessly in a number of vital background roles over the last 22 years. Runners-up were Rugby Triathlon Club founder Ian Payne and Roger Weddell, Rugby Lionesses coach. # The Mark Gallagher Memorial Award for Coach of the Year, presented by his wife Sue, was won by Newbold on Avon RFC coaches Phil Reed and Matt Davies. 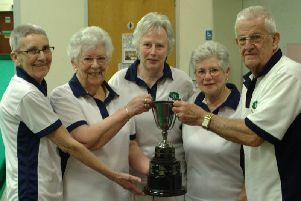 The club’s fantastic record last year included becoming Warwickshire Cup champions. Runners-up were Matthew Scoffham (Bilton Ajax Under 11s) and Carl Roderick (Rugby St Andrews RFC). l The winner of the Get Active award, for someone for whose commitment to fitness has made a positive impact on their life, was Lee Watts. It was presented by Cllr Heather Timms. # After an incredible season of achievements at all levels, including national Masters medals and gaining promotion to the Premier Division of the Arena League for the first time in 20 years, Rugby Swimming Club were awarded Club of the Year, presented by council leader Cllr Michael Stokes. The runners-up were Newbold on Avon RFC and Draycote Water Sailing Club. # Sportsman of the Year, presented by David Busst, was Rugby Triathlon Club chairman Mike Smallwood. Runners-up were cyclists Rob O’Connor and Craig McKee. # The Lifetime Achievement award, was won by Rugby & Northampton Athletic Club’s Grant Taylor, who has coached thousands of youngsters over the years since he started in 1974 and was in fact Olympic bronze medallist Katharine Merry’s first mentor. As well as coaching, he devotes countless hours to officiate at events. Grant was also a founder member of the Heart of England Athetics League, with his involvement dating back to 1978. Unfortunately unavailable to attend the evening, the award was presented by Mayor of Rugby Cllr Sally Wragg to members of his family. # Sportswoman of the Year, presented by Rugby Borough Council’s Head of Growth and Investment Rod Back, was Rugby Triathlon Club’s Tamara Hardman. Runner-up was canoeist Kimberley Woods. # Famous for his horrific career-ending broken leg, guest speaker David Busst a UEFA A coach, now works with Sky Blues in the Community. He talked about his career, which began by playing for a works team and non-league, overcoming various rejections and setbacks before making his Premier league debut for Coventry City in 1993. A central defender, he made 56 appearances before the injury against Manchester United in 1996, which left him needing 22 operations in two years, compounded by compartment syndrome and MRSA. He said many better footballers than him had not reached that level, so said the key is attitude, application and determination to achieve as much as you can from your sport and have no regrets. # Rugby Borough Council’s Sports and Recreation Manager Tom Kittendorf outlined some of the many highlights of last year, which included the half marathon, Park Runs, several charity runs and Warwickshire School Games. As well as the Rugby Hall of Fame, 2016 saw the opening of Rugby Town JFC’s new 3G pitch at Kilsby Lane and Rugby High School’s new sports hall, both of which were supported by substantial grants. Smaller amounts of funding, including those offered by the council, also continue to boost other sports projects throughout the borough. # Rugby Triathlon Club celebrated picking up both Sportsman and Sportswoman of the Year for Mike Smallwood and Tamara Hardman, with Ian Payne also recognised for his outstanding contribution to coaching and volunteering by being shortlisted for the Unsung Hero ‘ Volunteer’ Award. Mike’s outstanding achievements throughout 2016 saw him crowned English Champion, Double British Champion, Triple European Champion and Double World Champion for his age group in Triathlon, Duathlon and Aquathlon. He said: “2016 was a fantastic year for me which will be difficult, if not impossible, to repeat. “Having the achievements recognised at the Rugby Sports Awards means a great deal to me personally and for Rugby Triathlon Club. Tamara was nominated for her outstanding performances at Iron Man distance racing in 2016, which saw her earn an age group podium finish in Frankfurt before setting a new Rugby Triathlon Club record time of 9hours 47minutes at Iron Man Barcelona – winning her age group and qualifying for the Iron Man World Championships in Kona, Hawaii. After winning the award she said: “It was wonderful to be nominated by the Rugby Triathlon Club for the Sports of the Year Award and I felt incredibly honoured to have received it. “It capped off the year’s effort in an unexpected and extraordinary way.